"Carly's professional experience positioned her as one of the top candidates for the director of sales and marketing position at Rivers of Steel. She understood the nonprofit sector, and had experience in arts, tourism and place-making economies - all key elements in what Rivers of Steel was seeking. It was clear that Carly's M.B.A. education played a major role in her development as a professional and enabled her to demonstrate the strengths she possesses." "The sports, arts and entertainment management concentration of the M.B.A program is dynamic - its versatility is what largely inspired me to return to school to receive a graduate degree." 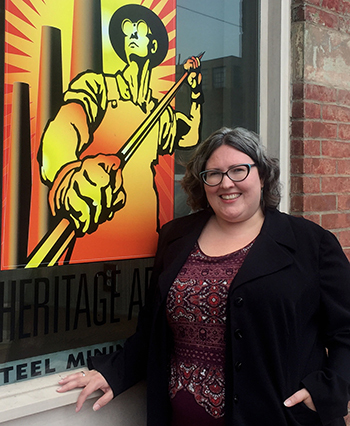 How did you become director of sales and marketing for Rivers of Steel? When I was hired for this new position at Rivers of Steel, I couldn't have been more excited … and I still am! In many ways, it's a natural evolution of the work I've been focusing on for nearly 20 years. I've been able to draw on my experiences of cultivating audiences and building relations to support our new program initiatives. The demands of this role fit with my data-informed approach to decision making and my creative, audience-centered approach to communications — perspectives informed by my Point Park graduate studies. Plus, the experience I gained working in programming and administration at The Frick Pittsburgh, in marketing and development with Gateway to the Arts and most recently, as the member services manager for Pittsburgh Community Broadcasting (90.5 WESA and 91.3 WYEP), have been invaluable in preparing me for the challenges of this new role. Why did you choose Point Park's M.B.A. program and how has it helped you professionally? The sports, arts and entertainment management concentration of the M.B.A program is dynamic — its versatility is what largely inspired me to return to school to receive a graduate degree. I'd been working in nonprofits for nearly a decade at that point, and was looking ahead at my career as an arts administrator. The appeal of this program was that it allowed me to gain a stronger foundation in business principles, while still being able to specialize in the arts and entertainment field. Strong nonprofits have strong bottom lines, but the ability to vision for the future, understand your audiences and stakeholders, and measure your impact on the community are equally valued. Point Park's M.B.A program with its SAEM concentration helped me to sharpen all the tools in my nonprofit toolbox. What are your favorite grad school memories? By far, my fondest memories center around the people I met. So many courses involved working together in small groups - I got to know the other students in my cohort well and made a few lasting friendships. While it's great to connect with others who share your passions, the network one builds can also be advantageous. What advice do you have for our students pursuing careers in arts and entertainment management? Embrace every challenge as an opportunity. Be aware of ways you can expand your emotional intelligence, not just your practical experience. Think big and follow your passion … but remember to consider the needs of others. Nothing worth achieving comes easily, but with the ability to imagine something better, the perseverance to make it happen and the willingness to work together, you can have a rewarding career and make real change happen. It may sound trite, but it's true!